Blue Stripe Long Sleeve Shirt Size 12 Petite. Blue Stripe Long Sleeve Shirt Size 12 Petite.. One pocket at chest level. Stripes vertical and horizontal. Condition is Used. Dispatched with Royal Mail 2nd Class. With a cotton bodice & long sleeved top area & a gorgeous floral patterned polyester contrast skirt. 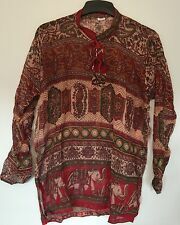 Here's a lovely top, by RK Stratman, for Harley Davidson that is in excellent new condition. The top has a zip neck, & short sleeves. Pit to pit - 18” - Across the shoulder seams - 15” - Length - 23”. Linen Blouse by Liz Claiborne Size 12/14 Petite. Gorgeous Coral Colour. Blouses - Ralph Lauren Size 6/small x 2 Pocket detailing on chest. Button fasteners front and cuffs. Purple/Punk logo on left cuff. Great blouses with a bit of class!! Also, another identical blouse but in pink!! Two great blouses for any girls wardrobe!! BNWT Ladies M&S Dark Denim Linen Long Sleeved Shirt Size 16Petite. BNWT Ladies M&S dark denim Linen Long Sleeved, button cuffed shirt with Utility Breast pockets. Size 16Petite. Proportioned for women if 5’3’’ or under. Classic summer wear. Condition is Brand New with tags. Dispatched with Royal Mail 2nd Class. Small, petite fitting. 100% linen (machine washable). Collarless with pearl button-through fly front. Long sleeves with turned back cuffs. Front i s shorter than b a c k. F lowing style. Length (Shoulder to back hem) 28". Shoulder to front hem 24". Very good Condition. Womens Long Sleeved Stiped Crop Top With Frill Hem And Heart Print Size 8. Condition is Used. Dispatched with Royal Mail 2nd Class. In good used condition. Cream beige top, cotton, size xs. GAP Maternity Teacup Print Shirt B/W S/P 10. Lovely shirt with print. Front pocket, button up neckline, button cuff. Roomy for size S. Excellent used condition. Please take a look at my other items. Lots for sale. All in good used or new condition (unless otherwise stated). From a pet & smoke free home. Dispatched with Royal Mail or Hermes Tracked (3-5 days). Please pay within 48 hours of listing ending. Thanks for looking! Topshop Crop Top Navy Size 8 Petite. Frilled hem and cuffs. C’est moi embroidered on front left (see photo). Condition is Used. Dispatched with Royal Mail 2nd Class. Length 60cm/23in, sleeve 58cm/22in, bust 110cm/43in. Main Color: black. 1 x T-shirt. Lovely NEW LOOK Off The Shoulder Striped summer top - Size 16. Condition is Used. Dispatched with Royal Mail 2nd Class.